What Happened to the French Left? Many thought the Parti de gauche would reinvigorate the French left. Why has the effort failed? The July 5, 2015 referendum in Greece raised the hopes of millions of leftists across Europe, but Syriza’s capitulation to its creditors later that month reminded many of the harsh reality of the European left: it is still in a deep, durable state of crisis. A few successes aside, the European left has proved largely unable to build counter-hegemonic organizations and win popular support. Nowhere is this failure more striking than in the case of France’s Front de gauche. A broad left coalition founded in November 2008, the Front de gauche brought together different leftist organizations: the newly founded Left Party (PG), the century-old French Communist Party (PCF), and various smaller leftist tendencies that merged in November 2013 to form a new organization, Ensemble!. 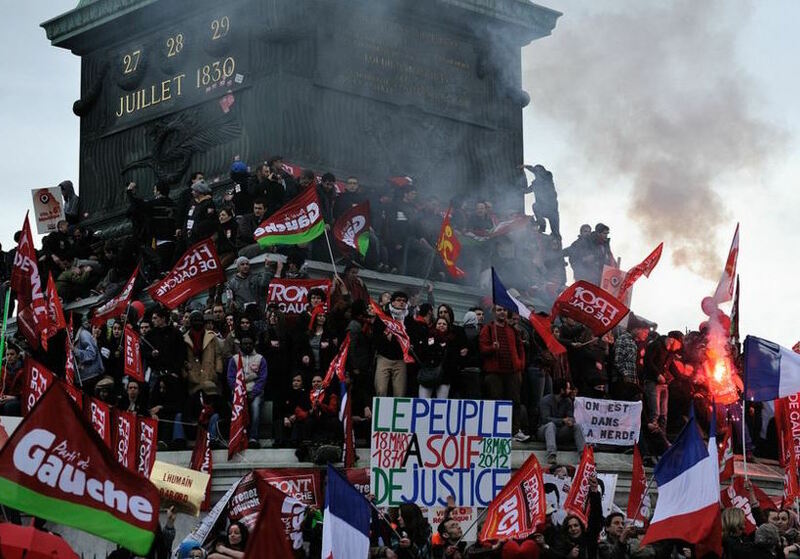 Its original goal was to build a broad left coalition that could challenge the Socialist Party’s (PS) hegemony over the French left through the fight for reforms. Although a fledgling organization, it was the PG rather than the PCF that was the driving force behind the coalition. The slow unraveling of that party explains much about the Front de gauche’s failure to challenge Socialist dominance. In July, the PG held its fourth congress, entitled “The Solution is the People.” Deemed a success by the leadership, the gathering took place in the context of what many call a “party crisis.” For a couple of years now, local committees throughout the country have been steadily losing members. Some voiced their disagreements with the party’s program and lack of internal democracy, others just dropped out silently. Out of the 8,000 members the party claims, only 1,700 took part in the vote on the competing platforms. And for the first time in the PG’s short history, there were two platforms, not just one. The majority platform, backed by the party leadership, garnered only 55 percent of the vote, while the contending platform got 45 percent. Demanding a radical break with the PS, the minority called for a renewed engagement with the working classes by defending “national sovereignty” and exit from the European Union (EU). But talking of the PG’s crisis partly misses the point. The entire French left, after all, is in crisis. From the post-Trotskyist New Anticapitalist Party (NPA) to the Greens (EELV), and the PS, every political organization is hampered by plummeting membership, factional disputes, poor electoral results, and a complete lack of strategic vision for the future. Even the “Lambertist” Independent Worker’s Party (POI), one of France’s far-left sects that still claims four thousand members, is on the verge of collapse. In particular, the PG’s purported crisis is not a one-time event. It should be understood within the context of its entire history. The party’s trajectory has been a rollercoaster: steady growth, a peak, and continuous plunge from then on, both in terms of votes and party members. The PG was founded in November 2008 by former PS senator Jean-Luc Mélenchon and other Socialist dissidents. They were joined by dissidents from the Greens like Martine Billard, who was PG’s co-president until 2014. A former Trotskyist who joined the PS in the late 1970s, Mélenchon has been around for quite a while now. He’s no fresh-faced Tsipras or Iglesias. He came into politics under the wing of François Mitterrand; he was a Socialist senator for twenty years and a minister in Lionel Jospin‘s government between 2000 and 2002. During the “no” campaign against the European Constitutional Treaty in May 2005, he was one of the major figures from the left wing of the Socialist Party who opposed the ECT. Like the Greek referendum in July, no political analyst saw the “no” victory coming, much less winning 55 percent of the vote. The major media outlets were unabashedly pro-ECT and demonized the “no” camp as a horde of anti-liberal populists. The unexpected “no” victory raised the hopes of hundreds of thousands of leftists who opposed the oligarchic nature of the EU. Later that year, popular protest led by immigrant-origin youth flared up in the banlieues throughout the country in response to the death of two teenagers who had been running away from the police and were electrocuted when they took refuge in a power plant. In spring 2006, mass demonstrations led by youth protested against a government plan to deregulate labor. In the 2007 presidential election, Olivier Besancenot, the popular spokesman of the Revolutionary Communist League (LCR), garnered more than 4 percent of the vote (1.5 million votes). In this context, new political organizations came to life: the NPA, trying to bring together all the various hues of the French far left in the wake of Besancenot’s successful 2007 campaign. And the PG, headed by Mélenchon. Not long after the PG was born, Mélenchon, Marie-Georges Buffet (then the PCF’s national secretary), and smaller left groups founded the Front de gauche. The Front ran its own candidates in the 2009 European elections and 2010 regional elections. Its original model was mostly Germany’s Die Linke. Die Linke was formed in 2007 from the Party for Democratic Socialism (which emerged from the ruins of the ruling East German Communist Party) and what was known as Labor and Social Justice — The Electoral Alternative (WASG), a predominantly West German grouping of disaffected social democrats and trade unionists. Its co-chairman, Oskar Lafontaine, had a similar trajectory to Mélenchon’s: he left the Social Democratic Party (SPD) as a result of its rightward shift to build a social-democratic left alternative. That the Front de gauche became the dominant force to the left of the PS was not inevitable. When it was originally founded, the NPA seemed like a very promising project too, capable of becoming a strong anticapitalist party that reached beyond the existing far-left ecosystem. A postman by trade, Besancenot was much younger than all the Front de gauche’s leaders, and a much fresher voice than PCF officials and former socialist cadre Mélenchon. The NPA also had a stronger social-movement focus than the Front de gauche, which was originally more electorally inclined. The history of the NPA’s demise has yet to be written. But the problem, in short, was that the party didn’t manage to seize the opportunity to truly broaden its social basis because it soon fell back into organizational rigidity. The Front de gauche, on the other hand, because it was predicated on the willingness to bring several organizations together, carried with it the idea that internal rivalries could be overcome to build a stronger left alternative. It worked, it brought people in as long as it moved forward. Party-building happened as the Front de gauche was growing; first the European elections, where we managed to carve a space for ourselves, then the regional elections, where we did better, and then the single candidacy for the presidential election, and then going above 10 percent in 2012. We were disappointed by the results, but there was something going on. There was the idea that we were making progress, we were waging a struggle, and it worked, and so it was worth it. I’m a red-diaper baby. And I was looking for a party that would fit me. I didn’t want to join the NPA, or the PCF — the PS, no way. And then I discovered the PG during the 2012 elections. At first I was disappointed that I couldn’t join up directly with the Front de gauche. And so I decided that the PG was a good fit. In 2012, Jean-Luc Mélenchon was the coalition’s candidate for the presidential election. He ran on a common program whose unifying dynamic was reminiscent of the 1972 Common Program between the PCF and PS. Entitled “Humans Come First,” it called for progressive reforms to fight the crisis and soaring socioeconomic inequalities; fought for the welfare state, labor rights, and the redistribution of wealth; and favored the renegotiation of European treaties and ecosocialist economic planning. It also called for a new constituent assembly (a body or assembly of representatives composed for the purpose of drafting or adopting a constitution) to rekindle French democratic life and bring the current regime down. Mélenchon garnered 11.1 percent of the national vote. His four million votes were six times more than Buffet’s seven hundred thousand (1.93 percent) in 2007, the best result for what’s left of the PS since 1981. Although Mélenchon didn’t manage to out-tally far-right National Front (FN) leader Marine Le Pen — as he had boasted he would — his campaign inspired hundreds of thousands. There was an alternative to a neoliberal bipartisan system; the “other left” could win and build a majority. Not this time, but before long. Many joined the PG on the basis of that enthralling promise. Unlike other groups on the French radical left, who no longer seriously reflect on the conquest of state power, the PG does have a strategic plan. But Mélenchon and his close circle are so obsessed with it that it obscured their political judgment. In the run-up to the presidential election, Mélenchon and his campaign team devised a “front against front” strategy, targeting Le Pen and the National Front in the hope that a rational debunking of Le Pen’s populist social program would sway segments of the working class. Underlying this confrontational but also moralistic strategy was the following belief: working-class voters are looking more and more favorably at the National Front, and so we need to fight the FN on its turf and show it’s wrong to vote for fascists. Ultimately, it was a failure. And Mélenchon’s speeches only added more weight to Le Pen’s public prominence. Yet this strategy was further put into practice during the June legislative elections in Hénin-Beaumont, a small town in the north of France where the Socialists had been implicated in corruption scandals and where Le Pen was running. The FN had been steadily organizing at the grassroots level for over ten years there. A couple of weeks before voting day, Mélenchon was parachuted into the constituency to supposedly defeat Le Pen with no tangible grassroots support. Mélenchon came in third (21.48 percent), behind the Socialist candidate (23.50 percent). The latter won with a short majority of 118 votes. After this much-publicized defeat, Mélenchon left the handful of dedicated Front de gauche activists in the town stranded, citizen’s assemblies suddenly stopped functioning throughout the country, and the Front de gauche’s hyped-up dynamic came to a halt. Since then, it’s been a long succession of internal struggles. The 2014 municipal elections was another massive blow for the Front de gauche. Polls oscillated between 5 and 7 percent in all the cities. The PG had tried to capitalize on Mélenchon’s fame and figure, but to no avail. Even if Mélenchon’s face was used on campaign posters in the streets, its talismanic, mesmerizing function seemed to have lost its magic. Meetings and rallies didn’t draw as many people in as before. “Many people joined the PG in 2012, with the Front de gauche dynamics. But they got tired of the disputes and the disagreements, and many stopped organizing,” Coléou says. A couple months later, the PG fared just as poorly in the European elections. Only Mélenchon was voted into the European Parliament under its banner. In a way, the PG was reduced to Mélenchon. This personalization of politics signaled the failure of a party whose organizing dynamics were grounded into media hype to compensate for the lack of a substantial membership base. Although PG members were disciplined, dedicated activists, they never numbered more than twelve thousand. And its membership is still overwhelmingly middle class — most are civil servants, teachers, or professors. Contrary to Die Linke, which won power in the Thuringia region in December 2014, no Front de gauche–backed candidate was elected to sizable intermediary office positions. The only tangible victory was a PG-Green coalition in Grenoble (a former industrial stronghold of five hundred thousand), but it was mostly due to the local balance of forces and grassroots mobilizations. For the next election rounds — the regional elections in December 2015, and the presidential election in spring 2017 — the prospects are bleak. In the Paris region, Pierre Laurent, the PCF’s national secretary, unilaterally announced his candidacy. This caused a stir among other Front de gauche partners. During the Fourth Congress, one of the main strategic resolutions had to do with the Front de gauche. While the congressional platform verbally reasserted its dedication to the coalition, it prioritized the “citizen’s movement” over building a stronger political force to the left of the PS that could include other left-wing organizations like the Greens. This speaks volumes about how unappealing the Front de gauche has become. There are, of course, external factors that account for the failures of the Front de gauche and the PG. First, social movements are at a historic low point. The last progressive mass movement, the pension movement, dates back to fall 2010. In spite of millions marching in the streets to oppose President Nicolas Sarkozy’s plan to radically reform the pension system, the movement went from one set-piece demonstration to the next before running out of steam. Most mass movements since have been reactionary, like the anti–gay marriage demonstrations of 2012–13. French Socialists excel at this kind of lesser-evil blackmail. In 2012, the real problem was not that people hesitated between Le Pen and Mélenchon — it was that they hesitated between Mélenchon and François Hollande. Many left-wing voters hated Sarkozy so much that they went for Hollande. Indeed, Mélenchon called his supporters to vote for Hollande against Sarkozy in the second round. Third, the presence of a strong far-right party, steadily garnering more and more of the popular vote, election after election, has become a characteristic feature of the French landscape. Voters disillusioned by Hollande’s economic failures and continued labor market reforms have increasingly turned to the FN rather than the PG. But there are also internal factors for the Front de gauche’s failure. At the heart of the bitter disputes between the PCF and the PG was the question of whether to ally with the PS during intermediary elections. This is due to the specific history of the PCF. As Julian Mischi demonstrated in Le Communisme désarmé, the membership base of the party — once the strongest communist party in Western Europe and the hegemonic force on the French left — has been steadily shrinking for the past forty years or so, and the PCF has consequently closed ranks behind its local elected officials. Because its organizational survival is predicated on clinging to elected offices, in particular in the historic “red belt” around Paris, the PCF has systematically favored alliances with the stronger partner, the Socialist Party. These factional disputes took central stage because the Front de gauche never had any real organizational presence in the first place. While Mélenchon’s campaign under the Front de gauche’s banner in 2012 captured the imagination of several million voters, and while it was based on grassroots organizing efforts (the various citizen’s assemblies that sprang up all across the country), it was impossible to directly join the coalition. As a result, the 2012 results didn’t translate into durable membership gains. The endless discussions between the Communists and the PG regarding the establishment of a membership system petered out. Some rank-and-file activists petitioned their leadership, but to no avail. Hence the coalition’s contradictory nature: although it was the Front de gauche, not its individual components, that enthused four million voters, it was never more than the sum of its parts. Although the Front de gauche was working from the Die Linke blueprint in their early years, now it seems that Mélenchon and the PG have their eyes set on Podemos, non-party-based political mobilizations, and a broader appeal to “the people.” It’s an odd mix of movementism and republicanism, of spontaneism and institutionalism. PG activists were continually told that wherever there’s a micro-struggle we need to support it, because that’s where the consciousness of everything will spring from: that you need to be against austerity, for the “human general interest” and so for ecosocialism. Struggles are seen as a moment of intense politicization. The PG strategy today is to kindle all those little fires. The PG no longer wants to convince people with its arguments and program. The party can only wage wars of movement in the long run. We never go for wars of position because we can’t hold them. The genius of our times is the art of movement. All those who wage wars of position are doomed to eventually have their positions blown out, because the ground itself is disappearing under our feet. The number one characteristic of our times is its metastable character — constantly on the verge of collapse everywhere. But the downside to that ultra-activism is that it wears people out. They bustle around for a couple of years — at best — and then they leave. Hence a high turnover among PG members. This movementism realizes itself in the citizen’s assemblies. They are meant to bring together not just seasoned activists but ordinary people, concerned citizens. Political organizations are welcome but they are not leaders. In the PG’s terminology, the party is a “scout” and a “trigger” — its role is not to lead but to help “the people” do so. The assemblies strategy is what the PG has opted for in the upcoming regional elections: the assemblies, not the PG, will choose what course of action to take. In Franche-Comté for instance, Gabriel Amard, a national secretary, doesn’t mention his leadership role in the party and only appears as an ecosocialist activist. The call for citizen’s assemblies isn’t new. This has been a foundation of Mélenchon’s strategy from the start. In the PG’s strategy for taking state power, citizen’s assemblies are the favored instrument and the basis for a citizen’s revolution. Mélenchon borrowed this idea from the Latin American experiments of the late 1990s and early 2000s, where people’s movements in Venezuela, Ecuador, Brazil, Bolivia, and Argentina swept progressive leaders into office. These movements found political expression through a constituent process. For Mélenchon, the citizen’s revolution is “an ideological object,” “a political strategy and a reality of our times,” but also a “theory” that can both make sense of the past and predict the future. In a talk he gave in June, Mélenchon argued that “the theory of the citizen’s revolution allows us to unify into an encompassing understanding what happened in fourteenth-century France with Étienne Marcel, 1917 in Russia, and many other occasions.” “Citizen” here both means that it is made by citizens and that it encompasses universal goals that go beyond social demands to reach “human general interest” and more precisely the defense of the ecosystem. Not only is the citizen’s revolution this all-encompassing theory and reality, but it’s the future on the horizon, too — “The citizen’s revolution, right now, for 2017,” prophesies the Fourth Congress resolution. Besides, behind their appealing bottom-up, horizontal, and participatory promises, citizen’s assemblies are in fact very much top-down and undemocratic. Much is effectively decided on beforehand by party members; “citizens” are welcomed to join and agree. The problem with citizen’s assemblies is that the program has already been written out, and there’s nothing “citizen” about it. It’s a bit of a con. People were made to believe that they’d have a say on the program. And so we tell people “we’ll do this, we’ll do that, we’ll have a citizen’s assembly, we’ll have an ecological transition and an ecological revolution.” People come in, they listen, they agree, but that’s all. The movementist outlook is only one side of the story, though. The other is a deep-seated institutionalism and republicanism. The paradox of Mélenchon’s citizen’s revolution is that it advocates a revolutionary break with the current institutional framework while at the same time operating through that very frame — the “revolution through the ballot box.” A revolutionary process is called for whose only outcome is an electoral one. The PG’s staunch republicanism entails a somewhat rigid understanding of laïcité, for instance. From the French Revolution on, the French republican left fought toe-to-toe with the centuries-old Catholic Church. A founding principle of the French republic, the separation of state and church and the protection of every citizen’s religious freedom is at the heart of laïcité. But, since at least the 1980s, this progressive principle has been used as a reactionary instrument mainly against France’s Muslim population. Since the Charlie Hebdo and Hypercacher terrorist attacks, Islamophobic incidents have skyrocketed and anti-Muslim sentiments have gained more ground. Laïcité, specifically its relation to Muslims, has been a real bone of contention on the Left. In Spring 2004 a law was passed that prohibited high school pupils from wearing the headscarf in school. Every left-wing organization was split asunder by the debates that had started earlier that fall, when two pupils were expelled for wearing a hijab. Some supported the law, while others denounced it as a Trojan horse for further discrimination against Muslims. The PG’s “hard line” on laïcité is one of the reasons why Sophia, a former local cadre in Lyon and then Nantes, decided to leave. A professed freemason, Mélenchon’s take on the subject was paradoxically much less rigid than the line that was advanced by several cadres and many grassroots members: while he argues that the absence of basic laïcité necessarily leads to internal conflicts and its goal is to protect people’s beliefs through a neutral public space, many PG members call for a restriction of people’s faith through repressive, exclusionary measures. During the municipal elections, the questions on laïcité focused on high school cafeterias, swimming pools, and graveyards. I had violent arguments with people. Some said that Muslim children should be forced to eat pork. Or else they shouldn’t come to the cafeteria. That’s a PG position: if you have dietary restrictions, why don’t you eat somewhere else? That’s absolutely rigid and insensitive. For many reasons, Muslims live in more precarious conditions than others. And so a little kid won’t be allowed into the school’s cafeteria and their mom will have to cook their lunch? The main target of the PG’s republicanism is the current political regime, the Fifth Republic. The product of a soft coup by Charles de Gaulle to solve the political crisis in Algeria, the Fifth Republic replaced the Fourth Republic’s parliamentary regime with a more presidential one. Unlike the US Constitution, however, no checks and balances were integrated into the system, and political power was increasingly concentrated within the hands of the president. All the more so after 1962, when the president started being elected by universal suffrage. Some constitutional provisions allow for the muzzling of the legislative body, the Assemblée nationale. The Constitution’s Article 49.3, for instance, allows the government to force through a bill without a vote under the cover of a rejection of a no-confidence vote. Indictments of the Fifth Republic and its monarchic nature are just as old as the regime itself. Back in 1964, before he first ran for president in 1965, François Mitterrand wrote Le coup d’État permanent, a comprehensive critique of de Gaulle’s personal power and the institutions shaping it. But the shortening of the president’s term from seven to five years in 2000 has only increased the president’s power and further weakened parliament. “These are real questions for the Left. Today, the question of the Fifth Republic is an obvious reality: three 49.3s in six months. Today, authoritarianism is an instrument the government very frequently resorts to, is at the heart of how the government is ruling,” Vannier argues. The PG’s solution to this regime crisis is to call for a Sixth Republic and the organization of a new constituent assembly, conjuring up memories of the 1789 constituent assembly that gave birth to the French Revolution. The call for a Sixth Republic — an object of debate within the party itself — rests on two fundamental assumptions: the idea that the institutional question carries enough weight and momentum to win broad popular support; and the promise that institutional change, brought about through the electoral path, is the key solution to people’s everyday problems. Last summer, Mélenchon came up with something few saw coming: the so-called Movement for a Sixth Republic (M6R). Of course, the double focus on the citizen’s revolution and a republican critique of the Fifth Republic has been at the heart of the PG’s political identity since it was founded. But M6R, which Mélenchon launched unilaterally, represents a turning point for the PG. What’s M6R? “M6R is an idea within a broader strategy,” argues Mélenchon. It’s an idea of how to make an idea a majority idea. Not any idea though. And it’s a different political practice. There was a paradox in the fact that a man launched an idea where there was no room for a providential man. But I think it’s a success. Let me point out that it’s the biggest political petition in this country. So far we’ve reached ninety thousand and I hope that by September 12 we’ll get to one hundred thousand. The original idea was to apply the citizen’s assemblies model to a single cause, the call for a Sixth Republic. Out of popular mobilization, bottom-up structures of organization were expected to emerge, and the people to organize themselves for the Sixth Republic. M6R acts to establish the Sixth Republic, so that humankind can be set on a path towards human progress. Such change implies a civic insurrection, a citizen’s revolution . . . The Sixth Republic will be democratic, social, green, secular, feminist, and emancipatory. It will guarantee the people’s sovereignty in all domains and vouchsafe new rights for everyone. The Sixth Republic is everything you’ve always dreamed of but never dared to ask for. Not only that, but when it’s established, it’ll be coming with new rights attached. Although M6R and the PG are “totally independent from one another,” Paul Vannier says, it was a turning point for the PG. For one, it exacerbated Mélenchon’s position outside the party. He had become an unaccountable loose cannon in the eyes of many. In August 2014, Mélenchon announced to the press that he would step back from formal leadership responsibilities. “I no longer have any operational responsibilities. I don’t run any party sector,” he said. And yet he still exerts moral authority over the PG. “He no longer has any leadership role within the party, but people still listen to him,” Coléou explains. Although he’s no longer an official party leader, Mélenchon is not through with electoral politics. In his keynote speech at the Fourth Congress, Mélenchon officially announced he would run for president in 2017. In the interview I did with him the day before, he declared: “I am available, and I’m working on it seriously.” He acknowledges that the “2017 blackmail” is killing the “other left.” And yet Mélenchon is confident. “I think we can flip the script. But I’m the only one who thinks so.” He’ll run, as the Front de gauche candidate or not. This unexpected turn created great confusion within PG ranks. Between September 2014 and January 2015, the formation produced no leaflets nationally. It was a turning point, but it was also a complete flop. Outside of Mélenchon’s head and close circle of dedicated supporters, no one seriously believes that M6R amounts to much. A brief scroll down several petition websites reveals that getting ninety thousand people to sign a petition online isn’t the achievement that Mélenchon is trumpeting. “At first many people wondered about M6R and how it related to the PG; maybe it would destroy the party. What we say now is that M6R was nipped in the bud!” Coléou laughs. Drawing on Podemos’s populist language and on the rhetoric that fueled the 2011 15-M movement in Spain and Occupy Wall Street, Mélenchon attempts to discursively revive the tripartite structure of the ancien régime that was the precondition for the 1789 revolution. His equivalents of the Third Estate, the clergy, and the nobility are the people, the media, and the “oligarchy” (also called the “caste”). The over-valorization of “the people” is given additional weight by the over-valorization of “the nation” and the “defense of national sovereignty.” The main issue here is the EU and the euro, in the wake of the Greek submission to its European creditors. What the Greek experiment has blatantly shown is that it is impossible to break from austerity within the framework of neoliberal European institutions. Hence the PG’s decision to work on a Plan B. The defense of national sovereignty was at the heart of the minority platform that got 45 percent of members’ votes. Many in the party object to this idea and call for “popular sovereignty,” but the idea of sovereignty is hardly ever questioned. Not only that, but in the French context, national sovereignty and the “sovereigntist” stance is usually associated with the Right: a xenophobic fear of foreigners, a fascination with law and order and the military, a fretting about France’s declining influence in the world, and so on. Is the turn toward sovereigntism the fate of all PS left-wing offshoots? Unwilling to endorse communist, ecologist, or Trotskyist rallying calls, they can only survive on steadfast republicanism. This is what happened to Jean-Pierre Chevènement, a former PS interior minister in the Jospin government who gradually shifted towards decidedly sovereigntist — and ever more reactionary — positions. Mélenchon and the PG are not Marine Le Pen and the National Front, obviously. But the use of national sovereignty in the congress resolution — a choice that prompted vocal disagreements from the floor — signals a further shift away from class politics and a politics of the oppressed more broadly to a narrow-minded nationalism. In Mélenchon’s mouth, this anachronistic (left-wing) nationalism has morphed into a worrisome nationalist critique of Germany per se. Mélenchon’s Le hareng de Bismarck — subtitled “the German poison,” with a pun on poison/poisson (fish) — is exhibits the purest anti-German sentiment. What Mélenchon thunders against isn’t austerity governments, neoliberal managers of capital, and the neoliberal logic of socializing the risks and privatizing the profits, but Germany. European capitalism and institutions are reduced to Germany, and Germany to Merkel. True, the troika speaks German — but the International Monetary Fund speaks French. Prioritizing the “the people” and the “nation” over a more empirically grounded understanding of social forces writes off the power relations underlying political struggle. It downplays class struggle within France, for instance, and the vicious attack that the capitalists and their main organization, MEDEF (Mouvement des entreprises de France), have waged against labor and (what remains of) the welfare state. Finally, claiming that “the solution is the people” pushes aside the question of building collective, democratic organizations and institutions that challenge the ruling order and the powers that be in the long run. Political struggle isn’t an apocalyptic one-off. As Catarina Príncipe and Dan Russell argue, “a viable left strategy for ending austerity can’t counterpoise the social and political: a political alternative must help create its own social basis.” Mélenchon and the PG behind him are so bent on electoral schedules and victories that they essentially leave the social out of the picture. It would be wrong to think of the PG’s line as straight and crystal clear, however. Quite the opposite. The party is characterized by its ability to say contradictory things, to twist and turn. Although Mélenchon’s deep trajectory has aimed at the citizen’s revolution strategy for quite some time now, he also keeps mentioning the “other left,” hollering at other left-wing parties to build broader electoral coalitions. It is walking on two legs: a citizen’s, anti-system leg and an “other left,” broad anti-austerity coalition leg, waiting for one of them to kick off. Mélenchon has always been the keystone of the PG’s architecture, its charismatic leader, and its thinking head. Ever since its founding, PG members have repeated that the party was not an end in itself. And the only thing that kept the party going was the Front de gauche dynamic. Today, Mélenchon has stepped back from party leadership and focuses almost exclusively on a stillborn populist “movement”; the Front de gauche is in the doldrums; and many PG members are tired, disillusioned, or just out of the picture. So what’s next? It’s quite possible that the PG will act as headless chicken — restlessly bustling around for a year and a half or so (say, until the 2017 presidential elections) and then, out of sheer exhaustion, drop dead. The problem of course is that the other left-wing chickens in France are not faring better. They are getting smaller and smaller, they’re out of touch with workers, and their politics are dramatically uninspiring. But as always with political struggles, you can never rule out a Chicken Run scenario. Back in March 1968, Le Monde editorialized that “France is bored.” A couple of months later, May 1968 happened. Clément Petitjean is a doctoral candidate in sociology and American civilization in Paris at the Sorbonne and Université Saint-Quentin-en-Yvelines.